Bent-over dumbbell rows are compound free-weight exercises that use many of your upper-body muscles. Similar to the bent-over barbell row, the supported position commonly used in the dumbbell version places less stress on your lower back and may be a safer option for anyone with lower back issues. To perform the exercise with your left arm, position your right knee and lower leg, and your right hand, on a bench. Leave your left foot flat on the floor and bend forward so your torso is horizontal. 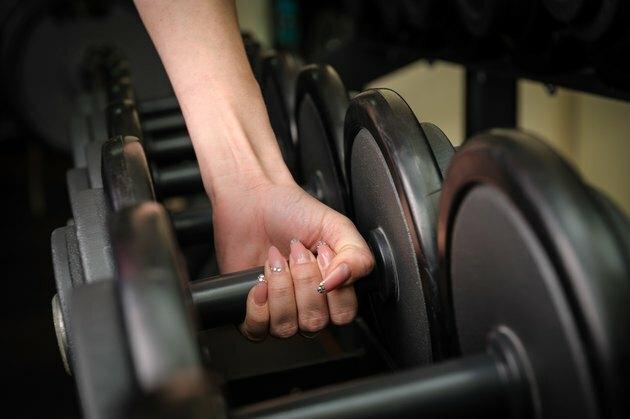 Hold the dumbbell with your palm facing the bench and your arm extended straight down. Lift the weight to the left side of your chest, then lower it slowly to the starting position. Perform the exercise with both arms. Lead with your elbow when you perform the bent-over dumbbell row to maximize shoulder extension. By creating as much shoulder extension as possible, you emphasize the work done by your latissimus dorsi muscles. Located on the sides of your back, your latissimus dorsi, or lats, are the primary muscles targeted in this exercise. The middle trapezius and rhomboid muscles -- located across and between your shoulder blades, respectively -- draw your shoulder blades together in a movement called retraction. Keeping your shoulder blades retracted gives your arm and back muscles a solid base from which to generate force. Pulling your shoulders back also increases shoulder girdle stability, which may help reduce your risk of suffering a shoulder injury when performing this exercise. Located on the front of your upper arm, your biceps brachii -- biceps for short -- flexes your elbow. Because your biceps are considerably smaller and weaker than your lats, many exercisers find that this is the first muscle to feel fatigued when performing bent-over dumbbell rows. Although the biceps are strongly involved in this exercise, their role is secondary to the lats. Bent-over dumbbell rows are commonly performed using one arm at a time so your free arm can be placed on an exercise bench to provide support. This reduces the load placed on the back but does not alleviate it completely. The muscles responsible for keeping your spine correctly aligned are your erector spinae. This group of eight muscles runs from the base of your pelvis to the back of your skull and works hard to maintain optimal posture while you work out. Rounding your back places an unnecessary and potentially injurious strain on these muscles and the underlying spinal structures. To minimize your risk, focus on keeping your lower back slightly arched and your chest held high.